The Faeries Fortune Slot is a five reels slot with four rows and 40 paylines. The slot comes from Big Time Gaming and is available on Smart Phones, Tablets and Desktops. The set of the game is a Faeries Fantasy Forest and the reels and symbols are graphically beautifully designed. From 40p you can spin the reels up to a maximum bet of £40. The Fearies Fortune Slot has in addition to a Free Spins feature also called Mega symbols which allow multiple payouts. More Big Time Gaming slots with Mega symbols are White Rabbit and Queen of Riches. Symbols and Payouts: The symbols of the Faeries Fortune Slot include playing cards symbols and theme related symbols. The playing cards are your low paying symbols and pay up to 60x your bet. The more valuable symbols are a 4-leaf clover, a horseshoe and a golden jewel. There is also a wild symbol which is also the most valuable symbols. is. You can win up to 1000x your bet with a combination of 5 symbols. There are also the Faeries Gems symbols which are your scatter symbols. Faeries Gems feature: You trigger the Faeries Mega Gems feature when any Mega Scatter Faerie symbols land on your reels. A key is awarded for each symbol position occupied by the Mega Scatter symbol in the play area. You can win up to 16 keys at any time when you land the 4×4 Mega icon on your reels. Each of your keys has a price between 40x and 4000x the stake per line determined by the number of keys awarded. Free Spins feature: You can trigger the Free Spins feature at the Faeries Fortune slot when you land any Megas Scatter Free Spin symbol on your reels. A Free Spin token is awarded for each symbol position occupied by the Mega Scatter Free Spin symbol. This way you win up to 16 free spins at any time and you can re-trigger the feature. During your free spins the first reel is populated with normal symbols and the 2nd, 3rd, 4th and 5th reels are populated with 4×4 Megas Symbols only! 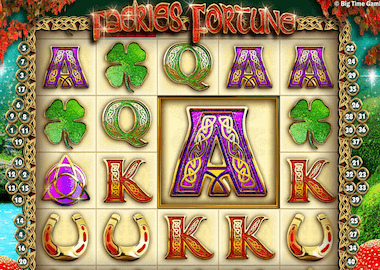 The Faeries Fortune Slot is a varied game that can trigger huge payouts with its Mega Symbols. You can play the slot here with us for free, without deposit or registration. Click on the Faeries Fortune slot above. You can play more ‘Big Time Gaming’ slots here. Recommended Big Time Gaming Casinos are the Next Casino, Miami Dice or Spinland Casino. If you register at these casinos, you can also redeem a welcome bonus and free spins. If you want to test free slots of various game developers, visit our free slots page.